FILE - A SpaceX Falcon Heavy rocket lifts off from historic launch pad 39-A at the Kennedy Space Center in Cape Canaveral, Florida, Feb. 6, 2018. 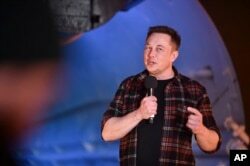 Elon Musk, co-founder and chief executive officer of Tesla Inc., speaks during an unveiling event for the Boring Co. Hawthorne test tunnel in Hawthorne, California., Dec. 18, 2018. Internet, SpaceX must become a leaner company. Either of these developments, even when attempted separately, have bankrupted other organizations," a spokesman said in an email. Last month, SpaceX launched its first U.S. national security space mission, when a SpaceX rocket carrying a U.S. military navigation satellite blasted off from Florida's Cape Canaveral. Another Elon Musk company, electric car maker Tesla Inc , said in June it was cutting 9 percent of its workforce by removing several thousand jobs across the company in cost reduction measures.